Much can be done with a goban and stones, other than conventional Go. Many intriguing games result from Go-like rules which may even directly benefit Go skill. Inventors have developed a dazzling variety of games with rules similar to Go in intuitiveness, wording, territorial objective, simplicity etc. And the results often bear comparison with or even challenge Go in beauty, entertainment value, difficulty and complexity. See also: standard rule sets and refinements of rule sets which (by design) do not Usually alter the normal course of play. This includes several systems of scoring. In the corner surrounded by black stones on the 8th, 9th or 10th lines. The Kill-all Game – how many stones to own the whole board? Roughly 17. Big Brother Go – a teammate may adjust a weaker player's moves, at some cost. A similar penalty can be added to rengo. Go Back – at any time, the game may be reverted to before the losing move and played out again, etc. Team Go – an experiment on DGS where a group of players would share an account. Records of 'team go' remain on the forums there. "praat-go" (Dutch, lit. "talk-go") was ongoing at jijbent: A 5D played against a team discussing their moves. Double Move One Time Each Go – each player has an opportunity to follow through on one big ko threat. Non-contact – forbids touching stones of the other player's colour. Stoical Go – makes all known forced Go cycles impossible by forbidding to capture immediately after an opponent's capture. Standard ko rules are not used. ConnectGo You must stack your stones on top of other stones on the board, or put them on the bottom row when making a non pass move. Unusual Gobans – SL accumulation including software links at bottom of page. Includes some things on toroidal Go. Toroidal Go – some resources are available for this variant. Bridge Go – Essentially, "liberties on the inside don't count", and so life is hard (impossible?) to make. Win by building a "bridge" across the board. 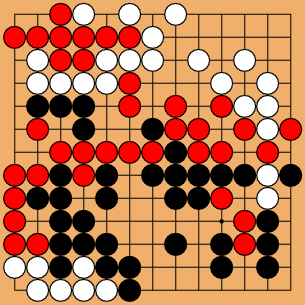 F-Go (Fair Go) – unique Go variant where players move simultaneously. Kingo – two types of pieces are used: pawns and kings. Score is number of kings, but capturing an enemy king also wins. Tao Go – players get a third color stone that has the power of Virtueless and Boundary Point Go, creating "Out of Bounds"
Variants that use a different set of stones, or with a normal turn other than "place one stone." See also Other Pieces For extra stones with special effects, see Superpower Go, above. Unequal Resources Go or =/= Go – The value of a prisoner is allowed to be unequal to the value of a moku of territory. Stonethrow – The value of a prisoner is half the value of a moku of territory. An instance of =/= Go template. See also Scoring and under historical variants. Tochki (Points or Dots) – a well-known game in Russia. Tanbo – Tanbo crudely models a system of plant roots which are growing, competing for space, and dying. Dango (no page, link is to namesake) – captured stones are moved elsewhere by the capturer. Anti-Atari Go – First to capture loses. Just for fun. Bridge Go – Win by building a "bridge" across the board. There's also a special capture rule where "liberties on the inside don't count". Go in fiction – occasionally someone imagines a fictional game that is partly inspired by Go. Renju – variant of Gomoku, but with extra rules to give a fairer balance between black and white. Cathedral – territorial -ominoes game. In its wooden edition, wonderfully haptic. CheGo – dropping chess-type pieces with the objective of controlling board squares.